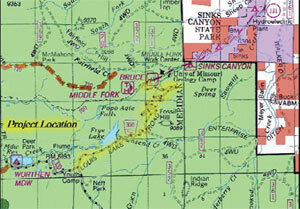 Louis Lake Road is located in Fremont County, Wyoming, and links the town of Lander and the Shoshone National Forest. The one-lane gravel road with turnouts is narrow, unsafe, and inadequate for expected traffic increases as more visitors are drawn to the area. Due to public concern over the economic impacts on the area during construction, Central Federal Lands Highway Division (CFLHD) considered using QuickZone. Because the road is such a vital link to the forest, residents of Lander in particular were concerned that real and perceived construction delays would deter vacationers, and local businesses would lose revenue. The QuickZone economic impact estimates the amount of revenue lost by reduced travel, the additional cost to freight traffic, the cost of lost time by delayed travelers, and the additional vehicle operating costs from the additional miles traveled on the detour. The QuickZone analysis will help determine when flagging operations and full closures will be allowed and to assure the public that delay costs and economic impacts on the town of Lander were considered in construction plans. The primary means of traffic control planned for the project is using flaggers when the twolane road is reduced to one-lane, two-way operation, and full closures during rock blasting and other dangerous operations. QuickZone estimated the delay a traveler would face during flagging operations of different lengths and capacities. The delay was also influenced by the amount of traffic that might take the detour during road closures. Due to the low volumes in the project area, the only delays were caused by the flagger operations. At the time of highest demand, at 2 p.m. on Saturdays in July, the demand on Louis Lake Road is 57 vehicles per hour. For a work zone of 3 km (1.8 mile) and with a clearance time of 13.4 minutes, the maximum user delay is 27.5 minutes. QuickZone can identify a range of user cost including motorist delay and vehicle operating costs. Potentially problematic public relations around work zones can be effectively mitigated when quantified estimates of delay are presented. QuickZone is suitable for assessing impacts on projects that combine traffic control strategies including flaggers, detours, and periodic full closures.